Despite their status, their Blackness rendered them social pariahs: the family experienced exclusion from the majority of white social spaces, institutions, and leisure activities (restaurants, ice cream shops, museums, etc.). This anomaly of a juxtaposition of class, education, and free Blackness during the era of slavery and the pervasive prevalence of prejudice would exact a mental conundrum on Charlotte’s psychological navigation through womanhood. Charlotte spent the majority of her adolescence in her grandfather’s house, kept out of segregated schools and homeschooled via private tutor. By being so sheltered and concentrated in that controlled environment, Charlotte would become a well-read polyglot. Though protected from sociocultural racism consequently missed out on the formative social interactions/ experiences most young girls have in childhood. She was introspective, quiet, and very accustomed to being alone. It was this isolation that caused Forten’s father to send her to the Higginson Grammar School in Salem, Mass. where Charlotte started her first journal. Grimke kept journals pretty much all of her life, the bulk of which were for the decade between 1854 and 1864 (minus 2 years 1860-62) as there was a HUGE gap of 20 years between her final two journals. Her initial objective in keeping a journal was to autobiographically chronicle her personal development. Charlotte’s journals are dynamic explorations of herself against her surroundings as a part of the Black elite and in the trenches and frontline for abolition. The bulk of her early entries are her inner workings of daily navigating the tensions and confrontations with whiteness' hatred and ignorance; hoping for retribution to be seen in her day. While exploring her emotional journeys and from processing dedication to her people, confusion as to racism’s rationale, why whites thought they were superior to Blacks, etc. Charlotte’s journals also draft her poems. Her writing style is quiet, pensive, and inquisitive, indicative of her homeschool upbringing in her elementary years, where she no doubt honed in her ability to hear and document herself without external, academic distraction. Her words have that old English voice; very ladylike and deliberate with narrating her days’ events, variegating between quotidian musings and deeper observances of the happenings of the day. Though Charlotte Forten was passionate about her poetry writing, she would be denied success in this space for obvious reasons: talented though she was, Charlotte was still Black. Her poetry was dramatic, vivid, dynamic, and linguistically intriguing with striking narratorial quality. Indeed, had she have been white her work would be taught in schools today, no doubt. William Wells Brown observed, “Were she white, America would have recognized her as one of its brightest gems…” Thus, Charlotte was more or less excluded from writing institutions, her potential writing career truncated by bigotry. Without question, Forten’s status and cultural identity yet placed her at an awkward cusp in society. It was her abolition work that would serve as a vehicle of sorts to maneuver between the two worlds and her work as an educator. On May 27, 1862, at age 24, Charlotte Forten set sail from New York City to South Carolina to participate in an opportunity she petitioned twice to attain: the chance to teach newly freed slaves in what was called the “Port Royal Experiment”: a Union-sponsored social experiment on the sea islands of St. Helena and Port Royal off the coast of South Carolina intended to determine if freed southern slaves were “fit” for life in freedom. 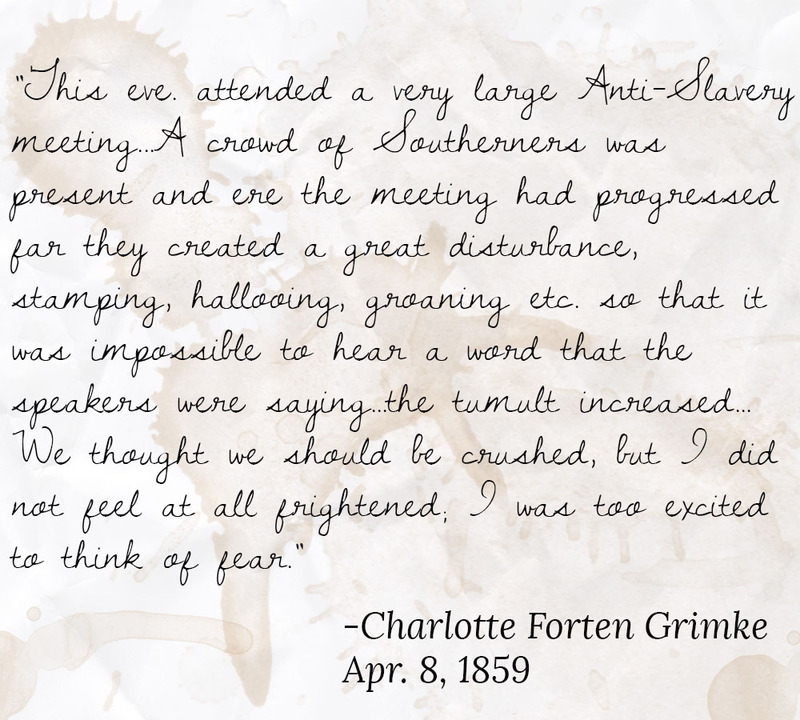 Charlotte foresaw participation in the experiment as the fulfillment of helping her people as an educator while also giving her an up-close and personal interaction with those who’d been subject to the system she and her family had been combatting through abolition her entire life until then. Charlotte extensively described her experiences and reflections in her journal—the bulk of which she shared with friend and poet John Greenleaf Whittier, who sent Forten’s detailed documentations to the editor of The Atlantic. In 1864 The Atlantic published Charlotte’s words in a 2-part series. Forten’s entries during this time reflect her strong belief in “beautiful” and “healthful” work—work she believed she was accomplishingas an educated Black woman educating former slaves on the Sea Islands. She delighted in her teaching duties, especially in seeing previously enslaved Black children voraciously lap up learning in their new lives of freedom. She remarked of the beauty of the women’s simple dress against the native island flora. She was haunted, entranced, and convicted by the songs and hymns of the workers in the fields, working in to the rhythm of their songs. Furthermore Charlotte was intrigued by the dialect of those she was serving. The linguistic delineation between herself and the Sea Islanders created ambivalence and consternation within Forten. Here she was amongst her own people, yet more of an outsider than with whites in upperclass Philadelphia. In this way the experience on the Sea Islands did a number on Forten. To come so far only to have her pedigree keep her from fully absorbing and participating in the quintessence, the EPITOME of the convergence of her passions relegated Forten to a living, breathing witness to her experience. And can we talk about this? There will be times in your life when you will be in situations and circumstances where you feel you should have something in common with those around you but no matter how hard you try to fit in, you are “reduced” it seems, to being an outsider. All you can do is what your gifts have equipped you to do. For Charlotte this meant being a teacher to the former slaves and a literate witness to all she was beholding. Her gift to herself as well as to us was her witness, her account of what she saw and how it made her feel. This was her primary purpose in going to South Carolina, and it’s what impacted an innumerable group on the mainland States to have a window into the humanity of those with which she was travailing.